It’s the end of 2016 and where is Employee Central Time Management? In this blog I would like to update you on the great progress we have made with Employee Central Time Management in the last 2 years. Meanwhile we have hundreds of customers around the globe using our absence management (Time Off). But when talking to customers I have the feeling that the Time Sheet is a little bit less known. 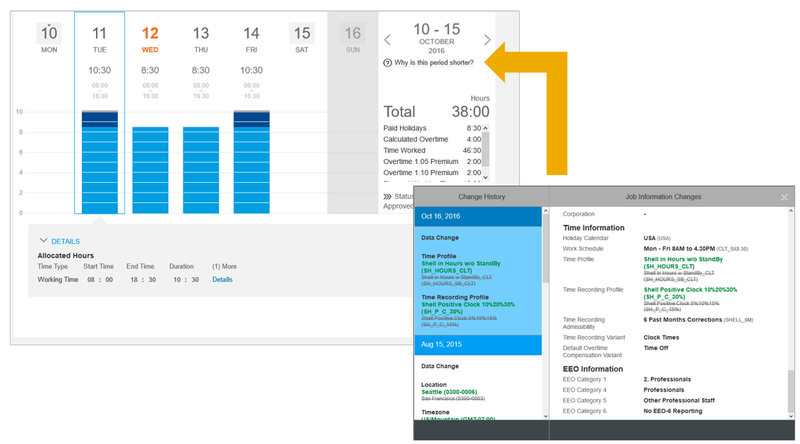 In the last years every quarter new features have been shipped and this is very well described by my colleague Volker Ruof in his quarterly blogs In in this post I want to provide one comprehensive overview of were we are at the end of 2016 with our complete Employee Central Time Management. To my opinion, ‘under the radar’ something great is being developed! One of the biggest benefits of working with these profiles is that is dramatically minimizes the administrative effort. 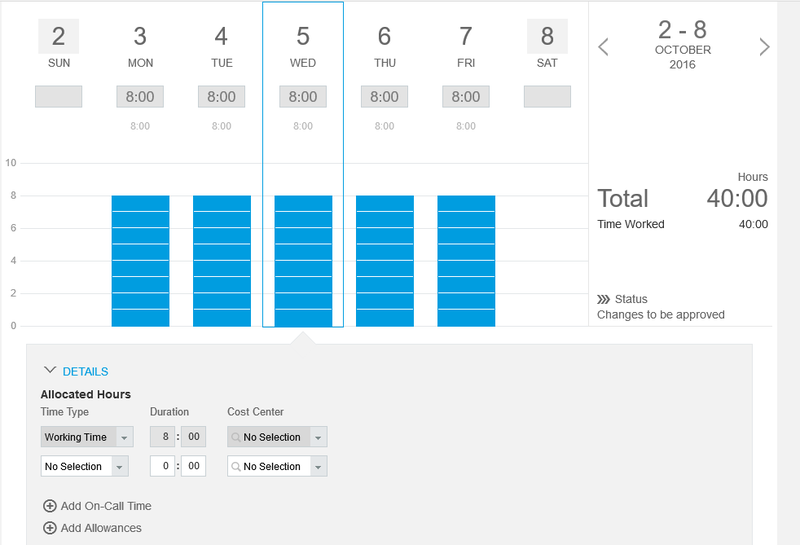 For example when an employee changes role the new profiles determine the new time sheet including new overtime regulations, applicable shifts, specific components to register on-call times, and allowances. 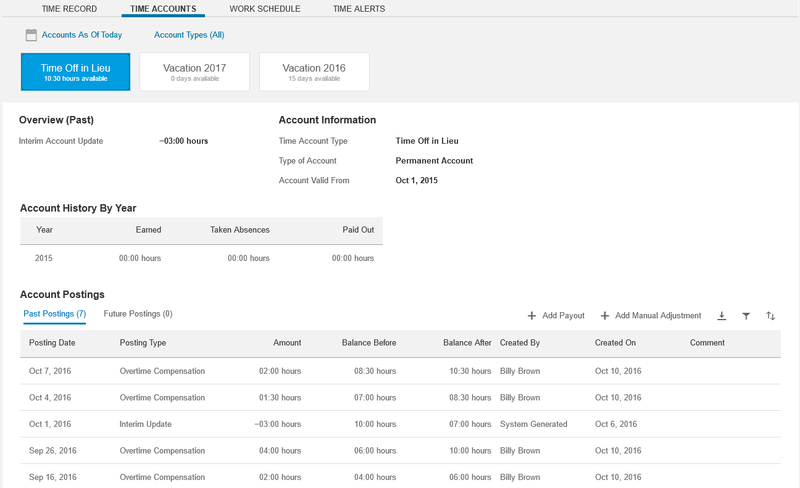 In addition, automatically balances get recalculated and updated per date change. This is displayed in the image below, which shows an employee change in the history part of the people profile and the impact of it on the time sheet where the employee sees that per the 16th of October a new time sheet will be valid. Now let’s look into the details. In order to make Employee Central Time Management understandable for everyone I think that a framework helps to digest all the functionality in Employee Central Time Management. Ultimately Time Management is always about Planning (e.g. in work schedules, holiday calendars, and overtime policies), Recording attendances and absences, and Evaluating the recorded time. After all data has been processed, it is about Analyzing the data and Integrating into follow up processes, such as payroll. So let’s explore all 5 components. Let’s start with the Planning component and zoom in to what all these profiles mean. One of the main components is the work schedule. 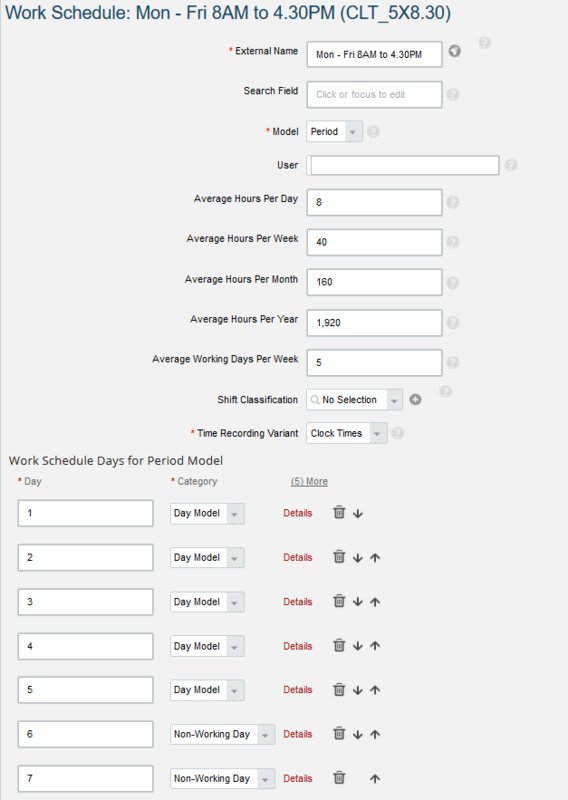 Work schedules can be setup to be clock based or duration based work schedules. Clock based has a start and end time per day and duration based only have a total of hours employees are expected to work. Furthermore, the work schedules can include (multiple) calculated unpaid breaks and day patterns to support models like early/late shifts. Employee Central Time management offers a flexible work schedule concept which offers 3 types of work schedules. 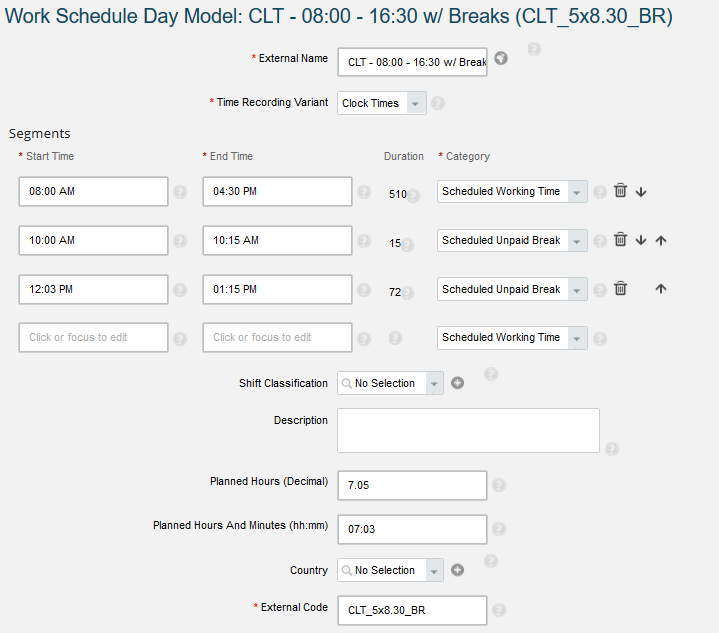 As you can see also unpaid breaks can be included in the day models. These generic work schedules can be linked to unique countries if required. Secondly, there is the Individual work schedule. This is intended for employees who deviate from the generic work schedules. 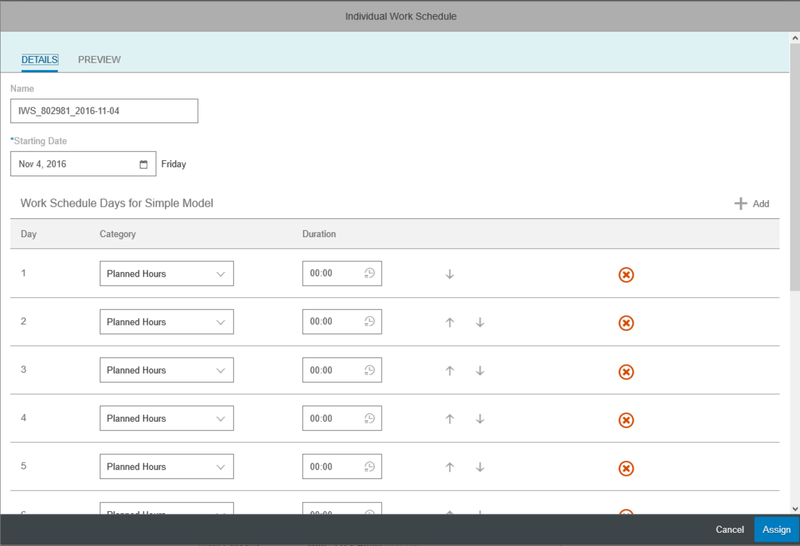 Based on a generic work schedule or completely from scratch the user can create a work schedule which is specific to one employee. If permissions allow, managers can do this themselves. 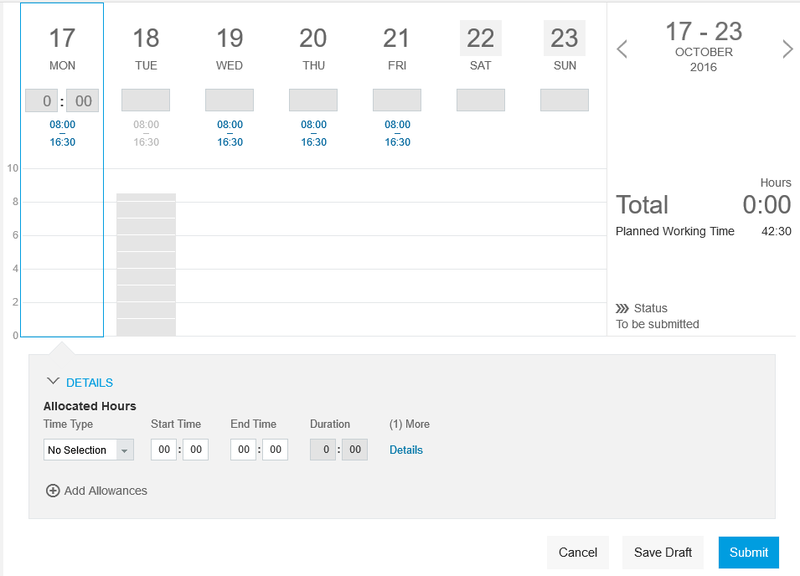 Especially for current SAP HCM customers this is a huge time saver, because in Employee Central it is not necessary to go to the admin section (IMG) and create a new generic work schedule. This can immediately be done for an individual employee in the Employment section in the People Profile. The following images show how e.g. managers can create an individual work schedule for an employee. 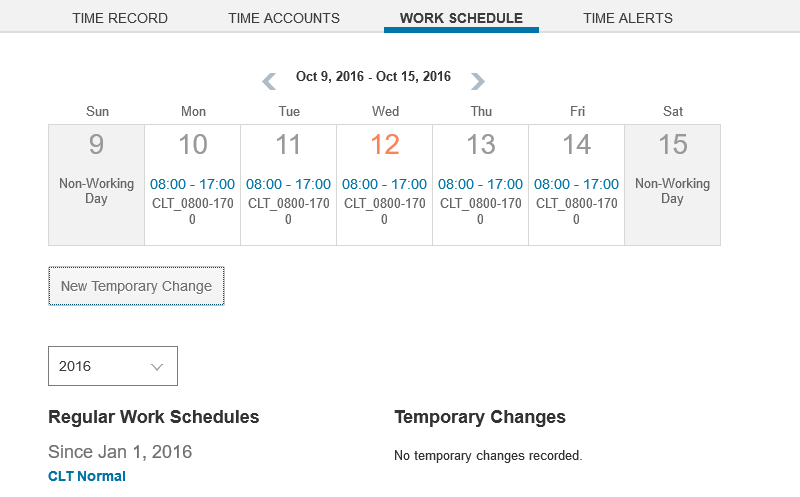 And the third example of work schedules are the Temporary Work Schedules. When employees e.g. substitute a colleague they can temporary be assigned to another work schedule. This functionality is only available for administrators via the Time administrator Workbench because temporary changes might have legal implications, which time administrators need to assess. Typically, this is not an activity which is allowed to managers. Each Time Account has a validity date and a bookable period. The balance on the Time Account is calculated based on accrual rules. The accrual and the eligibility for it can be based on flexible criteria such as work schedule, seniority, location, or other employee criteria. Accrual postings can be done in different frequencies and next to this posting to a balance can also be done manually as the image above shows. The accrual rules can take certain thresholds into account and stop in case a certain value has been reached or when employee is on sick leave. And for employees who join the organization mid-year or who get terminated accrual recalculation functionality is available. Now let’s look into the recording of attendances and absences. 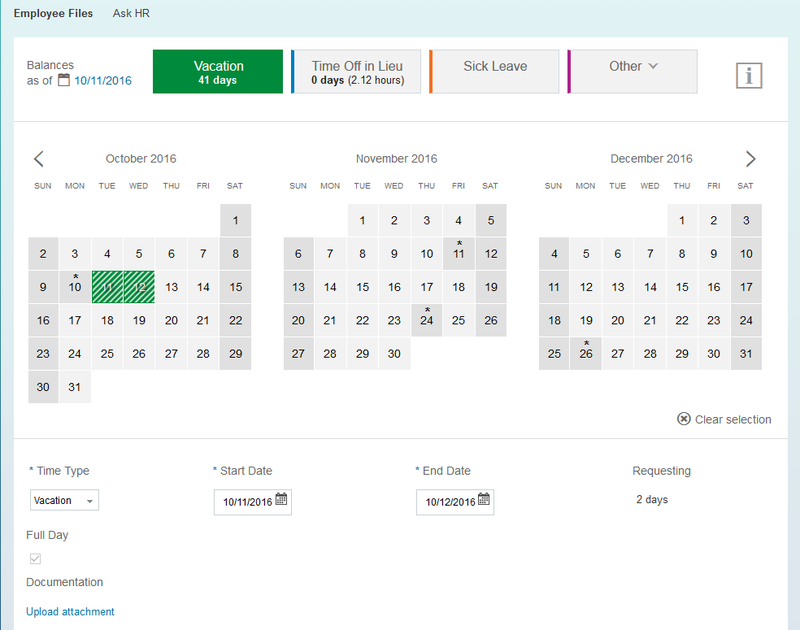 I expect that most of us know that Employee Central provides a single solution for all absence management including all types of leave such as vacation, sick, parental leave, etc. Now let’s zoom into the less known which is the time recording. This is done via the Time Sheet and the Time sheet is intended to be a single solution for all time recording. The time recording is based on the employee’s work schedule and absence information. Personally I wasn’t aware that there is so much flexibility and automation possible in the Time Sheet. So I will provide a full overview of the capabilities here. Time is recorded on time types (for example the working time in the image above) which can be allocated to (multiple) cost centers. The time types which can be selected by an employee is dependent on the time recorder profile. 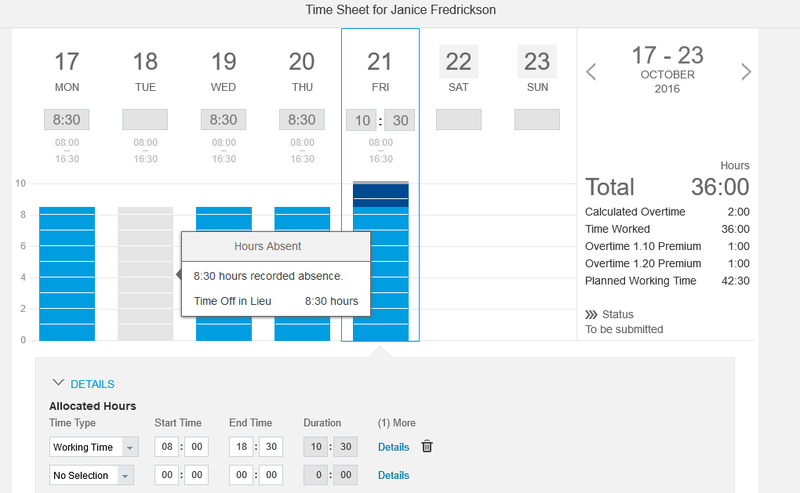 This means that different types of employees can record different time types. For some employees you might provide things like business travel or additional breaks and for others you don’t. The clock times currently need to be manually inserted in the application. For future releases it is planned to deliver an integration into clock terminals. In this scenario when the employee records 1 day automatically 2 unpaid breaks are inserted on the time sheet and depending on your configuration your employees can either make changes to this or they can’t. When they can’t the scheduled breaks are ‘grayed out’. When time is recorded in the time sheet an online calculation upon time recording automatically calculates the time and pay information according to the employee’s profile. This means that pay type generation rules for overtime, work on specific weekdays, public holidays, off-days, and on call times are automatically processing the time data when the employee registers the working time. In the following image it is displayed on the right what the rules for this employee have calculated. With regards to overtime premiums you see the overtime can be processed and weighted according to company policies. This means that automatically certain percentages can be calculated and applied when an employee fills out the time sheet. The employee simply fills out the total working time in the time sheet and the evaluation runs real-time to calculate the first 2 overtime hours are against 105%, from 2 to 4 hours is for 110%, and for example work on Sunday for 200%. Relatively complex rules and regulations can be configured in the time sheet configuration. 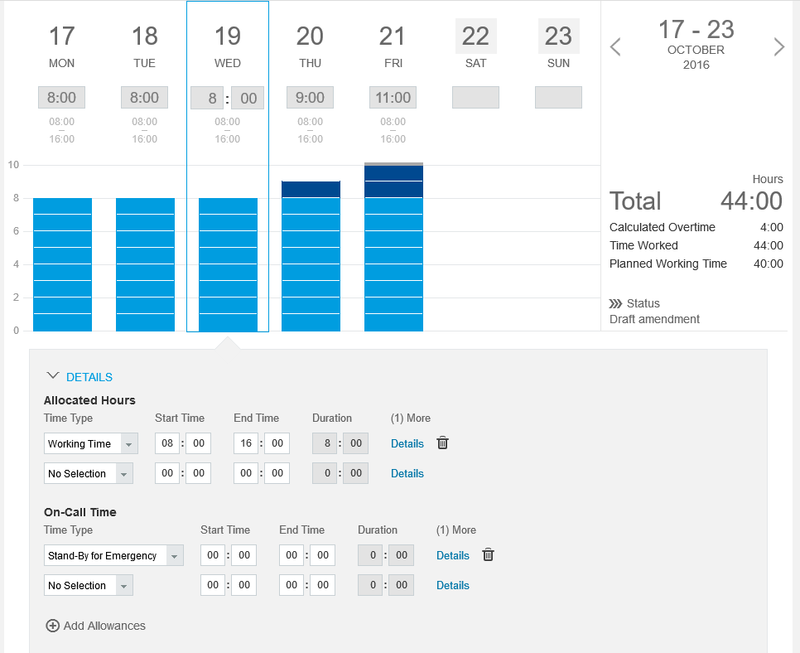 For example pay type generation for attendance / absence times at a specific clock time, like night bonus for work between 19:00 – 23:00. 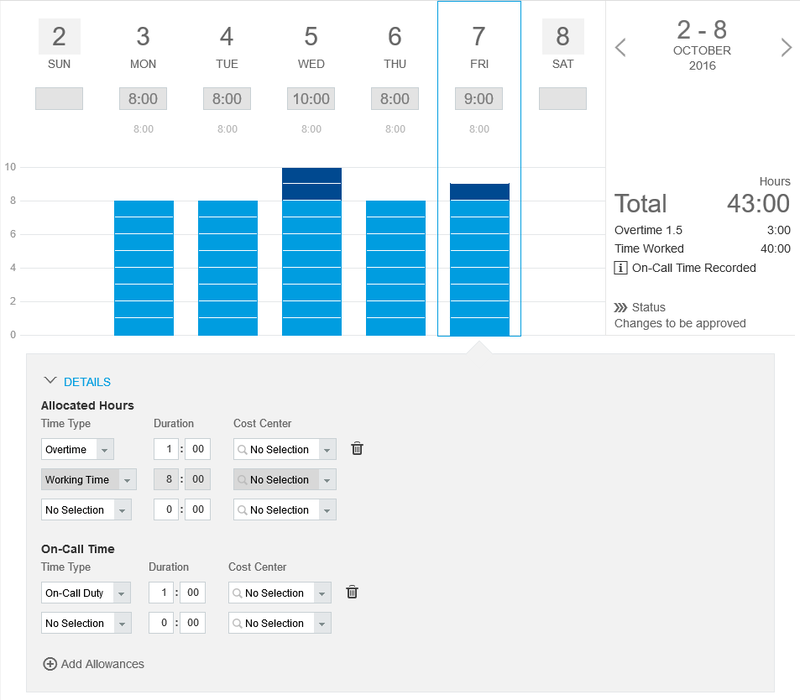 Or automatically generate shift premiums for daily shifts and rotating shift patterns (period models). The time sheet can also handle concurring pay type situations. 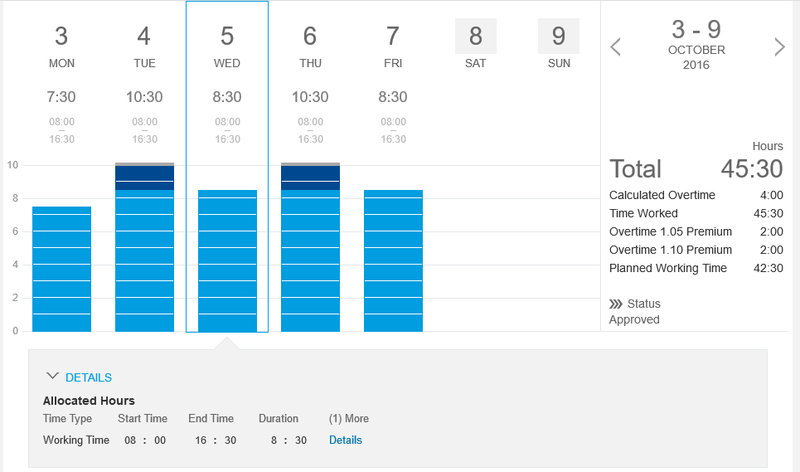 This is particularly useful when for example overtime on Sunday should not generate an overtime premium, but a higher Sunday premium. Or a combined Overtime and Sunday premium. So these types of scenarios can be configured and automatically calculated for the employee. And because this is automated, and only the values are available for the employee which are linked to their profile, this is heavily reducing the need for corrections as a result of wrong entries. Since this is all automated there is no chance for employees to fill out false values. So it looks clean and simple for the employee and it is super powerful for the organization. As you can see regular postings are done based on overtime which is recorded in the time sheet. In the image it is also shown that time administrators can facilitate a pay out if required. I have shown you some functionality of the Time Administrator Workbench earlier in this post, but it is worth to spend a bit of extra time on it. This functionality is delivered to support the time administrators. This is a specific role which is delivered within Employee Central to analyze recorded absence and time-account postings. 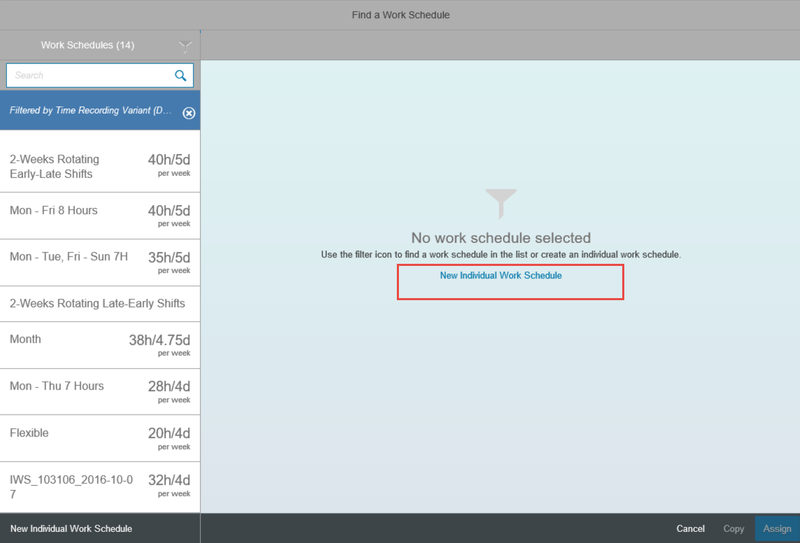 Time administrators can create temporary work schedules, but also delete, create, or edit new absences for employees. And as part of our localization efforts functionality has been delivered to link related illness-records together. In order to get a full long term absence overview this is a legal requirement in some countries. This functionality will become increasingly important because the more data gets imported into the solution the higher the relevance for functionality to monitor and make corrections based on error reports. So now we have captured and processed all this data….but how can we utilize it to minimize administrative work in other parts of SuccessFactors and 3rd party applications? Let’s take the example of a leave of absence…..when employees go on leave many disparate follow up processes need to be taken into account by the employee, the manager or HR. They need to insert an out-of-office, notify project teams, adjust expense reporting, reschedule training and potentially stop the paycheck. So what does Intelligent Services deliver to improve this? Well, it delivers recommendations in real-time to: update and adjust goals, reroute pending job candidates and plan for Successors. 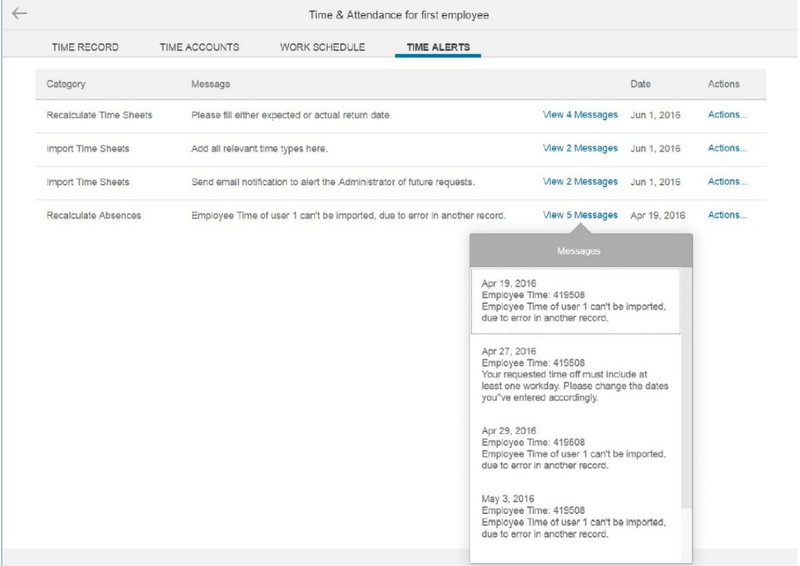 It also automates processes across SuccessFactors to schedules Learning Blocks, displays out-of-office status in SAP JAM, and to reroute pending document transfers. 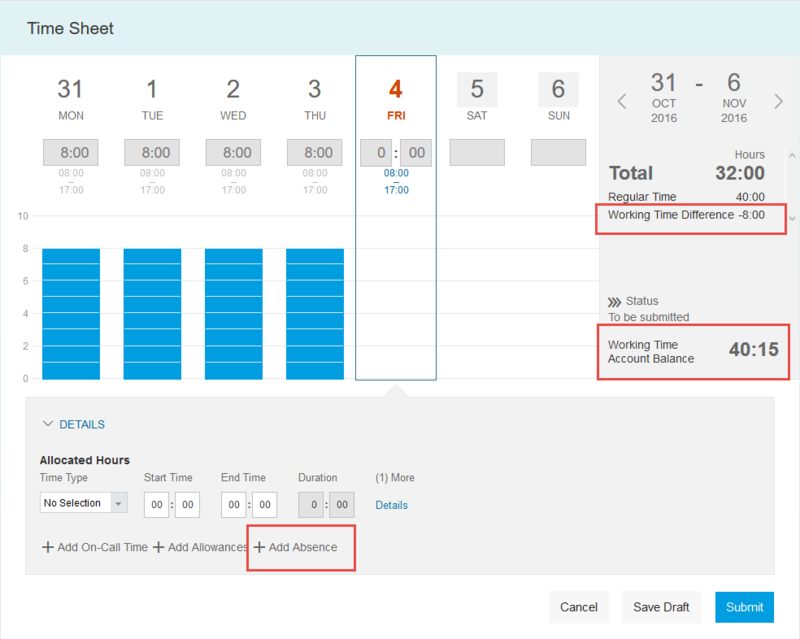 Employee Central comes with 5 predefined reports which help management and HR to get visibility in recorded times, pay types and the status of time sheets. It also helps them to really understand absence management including duration and frequency to identify potential health or organizational issues. And from a cost perspective an important topic for organizations is to assess the potential impact of outstanding leave balances. 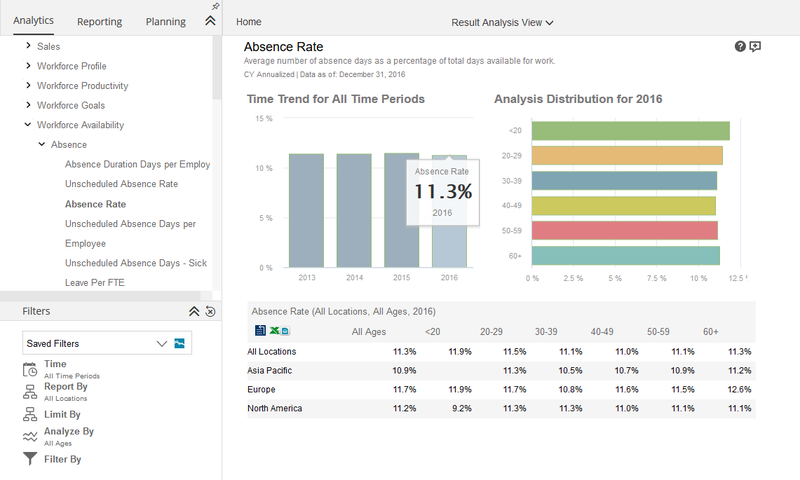 To get even deeper insight and the ability to really identify issues, assess them and to come up with action plans we deliver a dedicated metric pack in Workforce Analytics which brings visibility and insight into both financial impact, and potential risk areas for overtime and productivity. One example of a cool metric is the Bradford Factor which comes out of the box. By utilizing the Bradford Factor organizations can identify persistent short term absences and areas of disruption to the organization. Now let’s look into integration. With regards to integration we offer a variety of possibilities. Employee times and time valuation can be retrieved from APIs for 3rd Party Payroll Provider calls. There is predefined integration content delivered for the Integration Center to quickly and easily build outbound integrations based on all time management data. And it is already possible to import of duration based records to Time Sheet from external time systems. For Employee Central Payroll all processes with regards to time relevant payout are automated. This means that all recorded and evaluated time is paid out according to the correct valuation. But the full automation also includes functionality like the termination workbench and a leave liability framework which ensures correct pay out when employees get terminated. As a recap: What makes our Time Management solution unique? As part of Employee Central it provides our customers with one platform to plan, record, and evaluate global time management processes in one intelligent and intuitive solution that provides visibility to all stakeholders in the organization. I hope that this gave you good insights into the capabilities so far and has made you so exited about this functionality as I am! Please contact me in case you have any follow up questions. Very nice write up! I had questions about this in the EC Learning Room sessions. The EC Academy (THR81) content still covers only Time Off (and Work Schedule, Holidays and Time Profile), so I was curious how/where Work Schedule was used elsewhere. According to the session host, the THR81 content is being updated soon with more time related content. Good to see your blog and get a better idea of where this is (has been) going. Thanks! excellent summary. While time-off is indeed known and used by customers, most of the other functions are not known and asked for, at least by companies we have dealt so far with. Nevertheless, we keep informing our customers. Most of our German customers did not make use of the time sheet, regardless if for positive or negative time reporting. But most of our customers are really happy to see the improvements in the work schedule options and make use of it. I think with the improvements you introduce the positive time management is in a far better shape than everyone thinks. So your blog is a perfect medium to make that clear. Thanks! Excellent write up, Frans. Great to see that SAP is continually investing in expanding time module in EC. 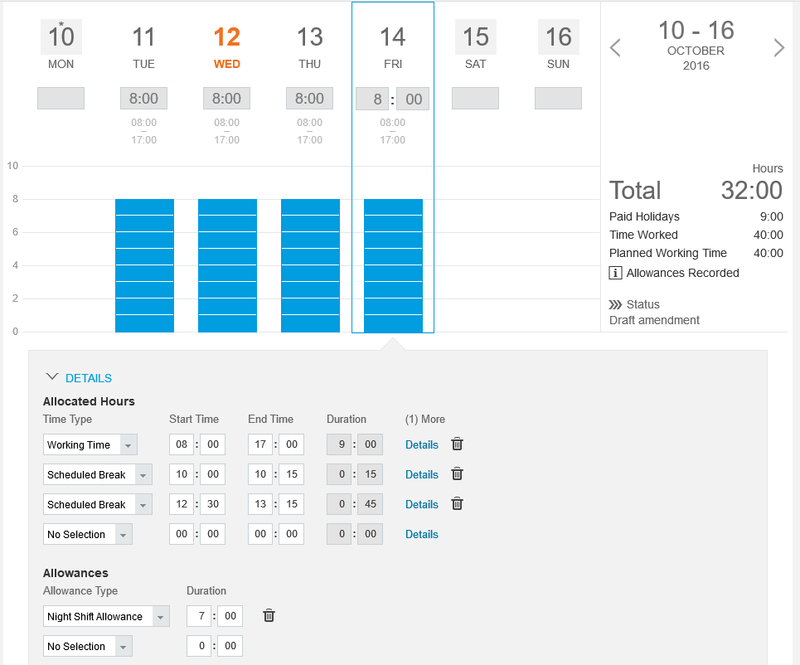 Most customers believe EC time off to be just a nice UI when compared to On Prem time management & not a complete solution. Will look forward to further enhancement & clarity on the product/features & functionality in 2017. Excellent job with this article Frans and hope all is going well. Great article on EC Time Management. Was in a feeling SF is behind in time solutions compared to market competitors. I am so excited to read the functionality coming up, these features for sure put EC Time solution ahead of other products time solutions. Hi Frans, Very good article. May I ask if there is already or plan functionality to integrate EC Time-Off with MS Outlook calendar (eg. 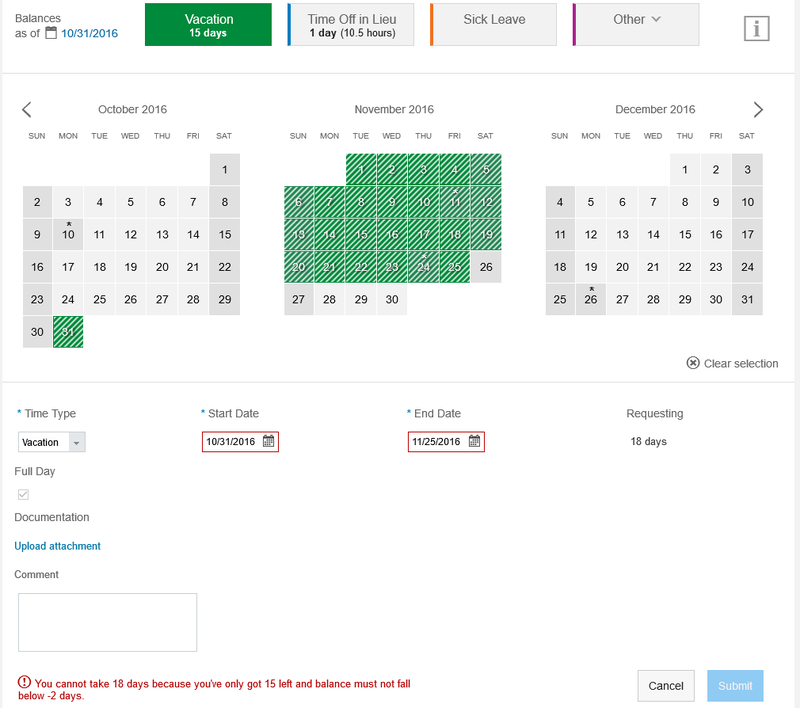 out-of-office) for Time-Off raised on the web desktop ? I know there is something similar for mobile. Can you enlighten me, please ?